Stockholm is an incredible city! Even during the freezing winter is worth to visit the Swedish capital! 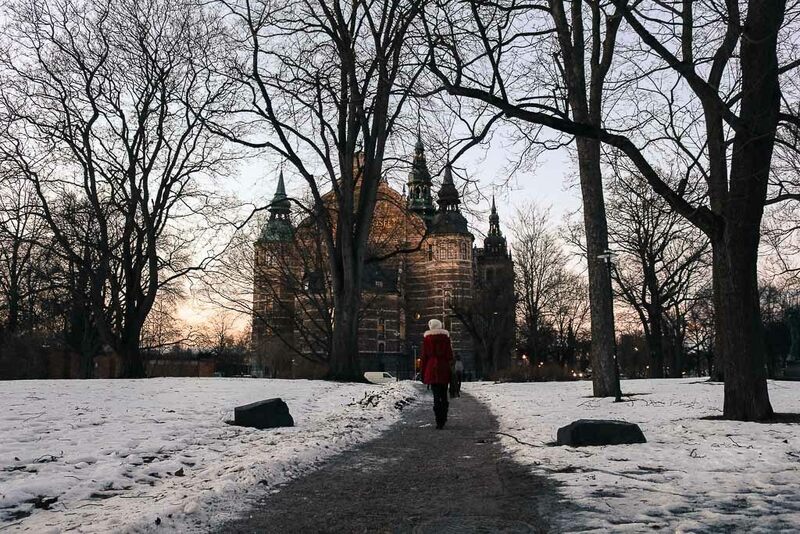 The secret to enjoy Stockholm winter is to plan your travel itinerary carefully, as the opening hours of the places change according to the season. Here you will find a list of what to do in Stockholm, best attractions for winter and our recommendations for places to stay. The good thing about to traveling to Stockholm in winter is that the city is quieter than usual, the hotels are cheaper and at night time you can have the streets only for yourself. We visited Stockholm in January, the city was covered in snow and the some of the canals were frozen, a beautiful scenery. It was really cold, the average temperature during the days was – 3ºC and at night it dropped to – 10ºC. So before thinking about what to do in Stockholm in winter, you need to think about warm clothes, especially gloves, hats, and scarves. If you are traveling to Stockholm for the first time keep in mind that the city is an archipelago, but even with many bridges and canals, the city is easy to navigate and the public transportation works perfectly. 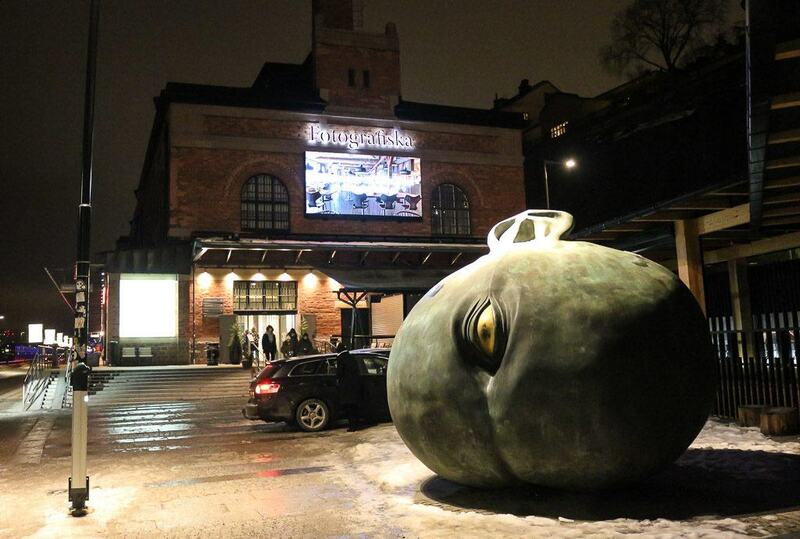 Actually, Stockholm subway stations are known for being super artistic. So you don’t need to worry to find the best area to stay in Stockholm as you can get around easily. My suggestion is to find the best place to stay in Stockholm according to your budget and style. We stayed at the Generator Hostel at Norrmalm area, close to the train and bus station, and the commercial center of the city. This neighborhood is full of life, there many options of hostels and hotels. The Generator Hostel has a super cool concept, the building is stunning, the bar is super trendy and the restaurant offers gourmet food. The rooms are clean, comfy and have everything you need for a good stay. Of course, is not a super cheap hostel, but I believe it’s a good value for money, especially because of the location. You can choose from dorms or private rooms, book your place at Generator Hostel here. Looking for another place to stay in Stockholm Norrmalm neighborhood? Check the Radisson Blu Waterfront. Close to the central station, it’s perfect for the traveler arriving in Stockholm by plane, train or bus. Plus, it’s a few minutes walking from the historical Gamla Stan. If you want to stay in the middle of history, the old town is the perfect address. 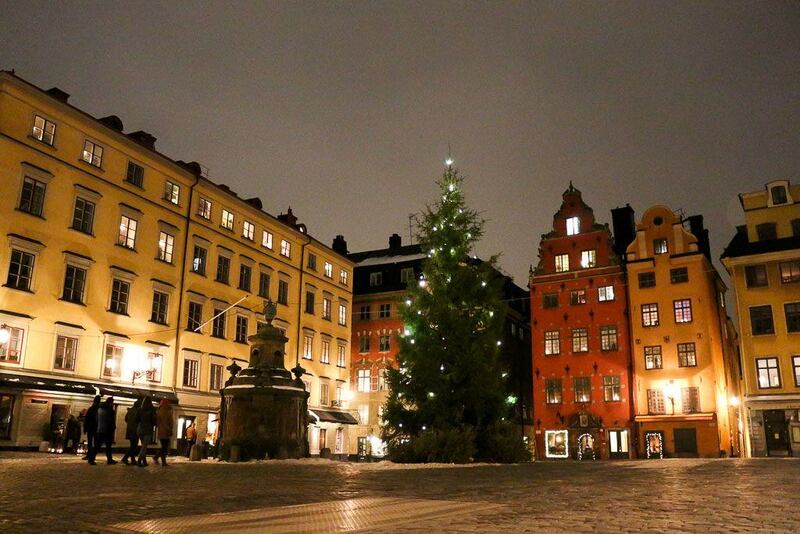 Check the options for hotels in Gamla Stan here and choose the best place to stay in Stockholm. If you don’t mind staying a bit far from the action, other two good places to stay in Stockholm are the Clarion Collection Hotel at the Östermalm area, and the stylish Hotel Rival located at Södermalm, the trendiest neighborhood in Stockholm. None of these hotels shake your boat? No worries choose where to stay in Stockholm using these three websites: Agoda, Booking.com and Airbnb [sign up here and get some Airbnb credits to use on your next trip]. 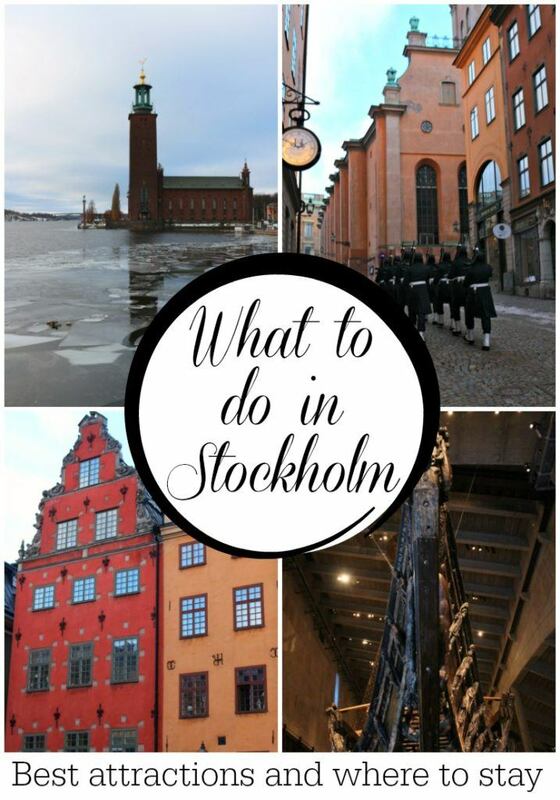 What to do in Stockholm in winter time? Now that you know the best areas to stay in Stockholm let’s focus on your travel itinerary. We spent 3 days in Stockholm, and our days were jam-packed with activities and attractions. What means that our suggestions of what to do in Stockholm can be spread in 4 or 5 days in the city. It’s all about finding your pace of traveling. The idea is to show you the best things to do in Stockholm, points of interest and what you can’t miss. 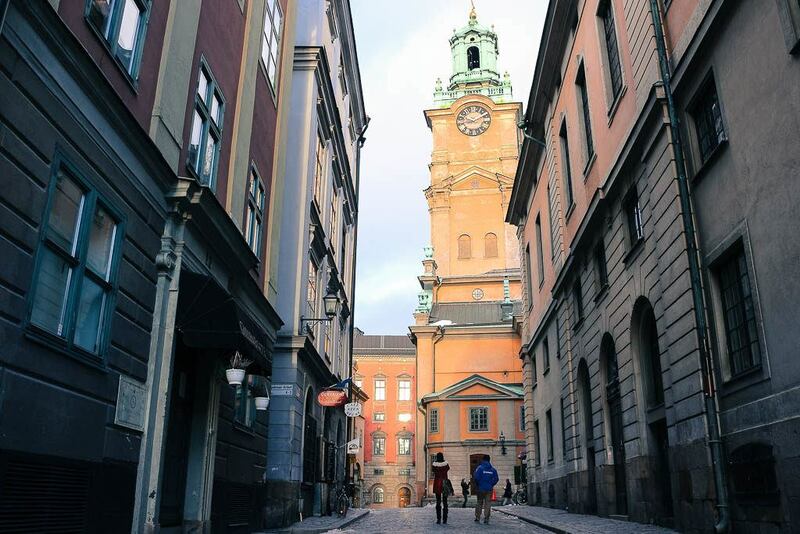 The first thing you must do in Stockholm is to go for a walk at the old town. The Gamla Stan dates back to 1252 with stunning buildings, cobblestone street, and history in every corner. It’s a beautiful place to admire, and it becomes even more interesting when you learn the history behind the buildings and discover hidden gems in this ancient neighborhood. There many companies offering tours in Stockholm old town, we choose Our Way Tours and love it. Our guide was awesome, he knew a lot of interesting stories, some legends about the buildings and streets, very informative and not boring at all. It was a cold morning, so he planned some strategic stops for coffee and hot chocolate. Starting your visit to Stockholm with a walking tour like this will set the mood for exploring the old town and the modern Stockholm. After your walking tour through Gamla Stan take a time to explore the Stockholm Royal Palace. It’s one of the largest palaces in Europe with more than 600 rooms. The Palace is the official residence of the Swedish King, you can visit the Royal Apartments and the Treasury. 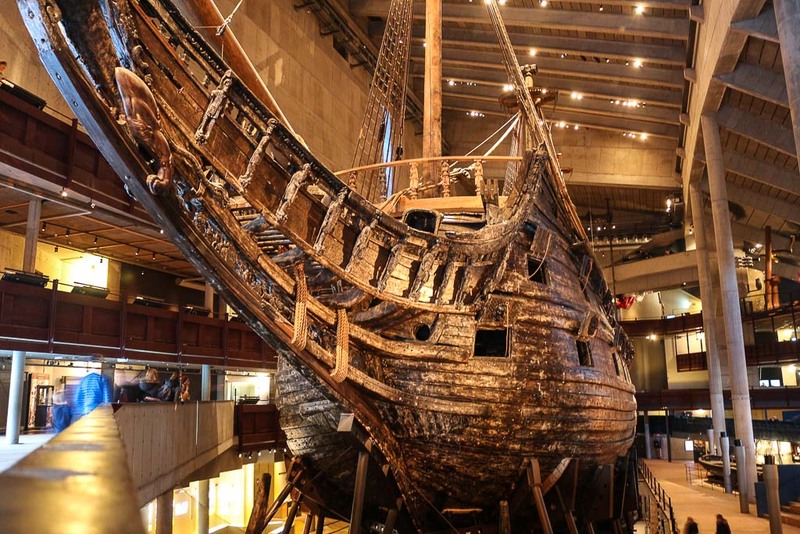 Vasa Museum – this was the first museum we visited in Stockholm and it’s impressive. Since I met Rob [back in 2006] he talks about the Vasa Ship and how he wanted to see her. So as soon as we stepped inside the museum Rob was like a child, and I was astonished by the beauty and the size of the ship. It’s one of the most visited places in Stockholm, the 17th-century battleship is a masterpiece and the museum offers a really interesting experience. Ask for the free guide tour [in English and Swedish] or download on your phone the audio guide. Skansen – founded in 1891, the Skansen Museum is the oldest open-air museum in Europe and a truly travel to the past. Created to preserve and showcase the rural culture of Sweden, it showcases old houses, farmsteads, and gardens. There you can also find a Zoo with many Scandinavian species. Nordic Museum – this is the place where you can learn and understand the Swedish way of living since ancient times to nowadays. The museum is huge and stunning, definitely a place to visit in Stockholm. There are different exhibitions happening in the Nordic Museum, you can choose one or visit them all. 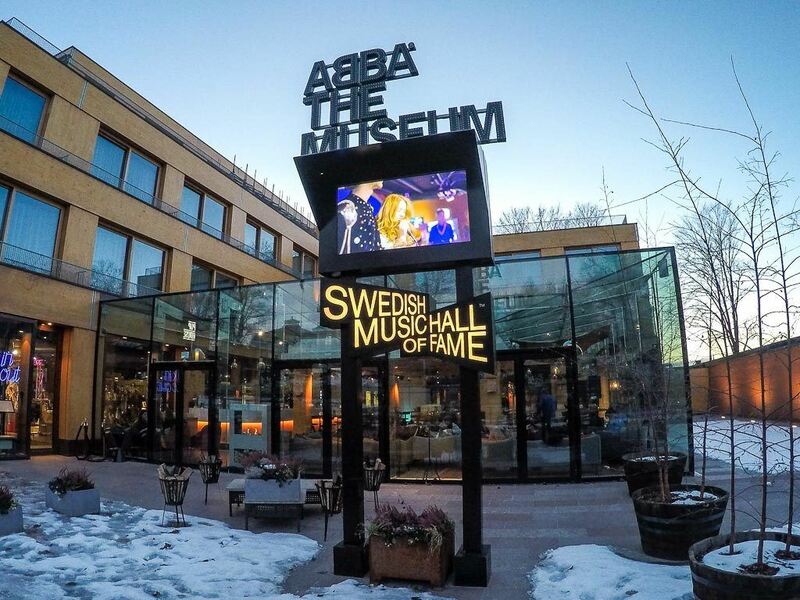 ABBA Museum – a great place to visit in Stockholm if you want to mix history and fun, or if you are big fan of the Swedish band. The Abba Museum is not only a place to see the costumes and the memorabilia, the museum is all about experience, to the point that you can record your own ABBA music. Spritmuseum – Hours dedicated to good alcohol! Even if you are not a drinker it’s worth a to visit it. Different exhibitions talk about the ancient traditional of producing alcohol, especially vodka. The museum is a sensorial experience, with smells, tastes and food! Apart from the museums, at Djurgårdsslätten you ride a bike, a walk or just sit and relax. We were so lucky, during our 3 days in Stockholm the sun was shining and the days were beautiful. 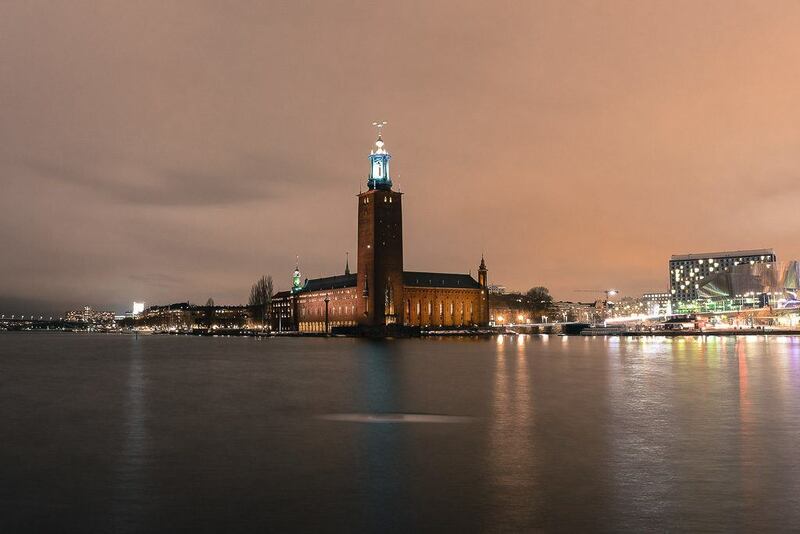 The City Hall is one of the top attractions in Stockholm, the impressive building is one of the symbols of the city. Inside there are two famous halls where the Nobel Banquets happen. You can admire the building from outside or book a guided tour to discover the history inside. There are many delicious cafes and restaurants in Stockholm, the list of places is endless. We are not food bloggers, but I can’t write a guide about what to do in Stockholm without mentioning the Östermalm Saluhall. 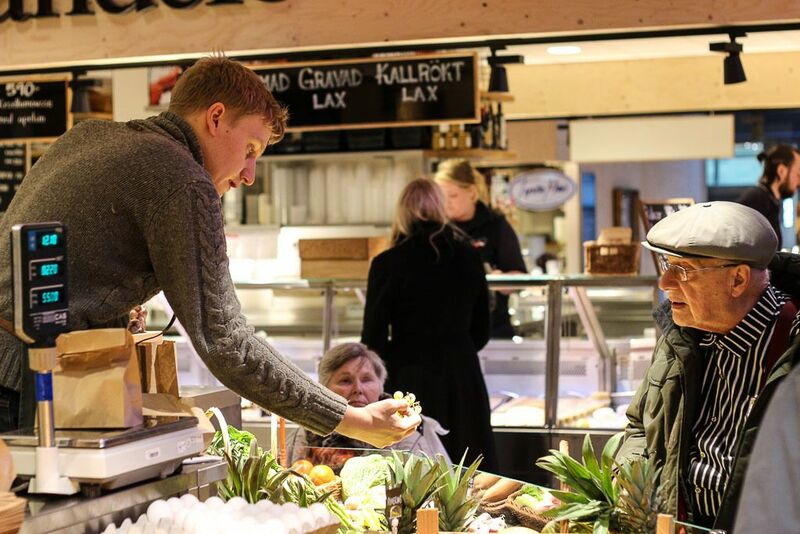 This food market is a must visited place in Stockholm. What is so special about it? Well, it has organic food, fruits, veggies, coffee, sweets and savory dishes that you make you drooling from the moment you get inside of it. The traditional food hall dates back to 1880’s but the original building is passing through restoration. Until 2018 the restaurants and stalls will be serving the same delicious food on a temporarily covered market on the square in front of the original building. Our guide of what to do in Stockholm wouldn’t be complete without a night out. Face the Stockholm winter and go for a visit to the Fotografiska Museum during the evening, I’m sure you won’t regret. Fotografiska is my favorite museum in Stockholm because is it’s more than art and more the information. It’s a place to connect with people, see beautiful artwork and enjoy the night while sipping a cocktail and listening to fine music. You can visit the exhibitions during the evening and then go for a dinner or drinks at the restaurant/bar located on the top floor of the building. The view is beautiful and the menu mouthwatering. So if you need to choose one place to visit in Stockholm during nighttime, my suggestion is the Fotografiska Museum. 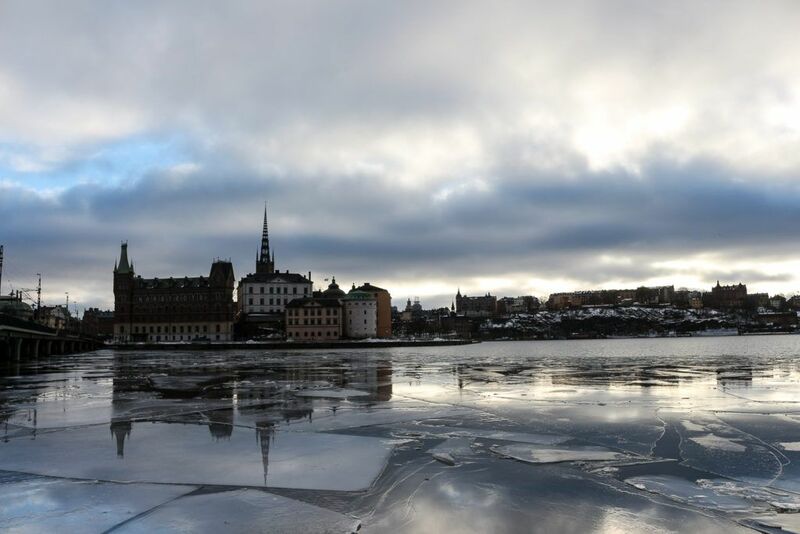 Art, history, stunning places and good food, Stockholm is a great travel destination even during winter time. Follow our suggestions of what to do in Stockholm, where to stay and places to visit. I’m sure you gonna have a great time there. My last advice is about how to travel to Stockholm. To find the best flights use Kiwi.com or Skyscanner, they are the best websites for searching and booking international flights. If you are already traveling through Europe or Scandinavia, a train trip can be a good choice. We traveled through Scandinavia [and Central Europe] all by train. For 3 months we traveled with Eurail Pass and the experience was easy and hassle free. For more information about traveling with Eurail check out our blog post: 7 reasons to travel with Eurail Pass. Do you like this post?! So Pin it for later! Ready to travel to Stockholm, Sweden? Did you like our list of what to do in Stockholm? Book your hotel, pack your bags and have in Stockholm winter! Very good and interesting travel tips! I didn’t even know about ABBA museum 😉 and I live in the country- always something new. Thank you. Sweden has some many things to do and see that i believe it’s hard to be apart of everything. I’m happy you liked the post! Lovely post. I’ve always wanted to go to the Scandanvian region in the summer for the long days and am not sure that I’d want to go in the winter. If I did this would be a great starting point for a trip. What were the daylight hours like? Summer in Scandinavia is a magical time, but winter has the snow charm that is unbeatable. The daylight is very short during winter, in January it was from 7:30 AM to 4 PM. You have listed some of my favorite places in Stockholm. It must have been a great experience to be there during the Winter. I have been there twice, but both times in the Summer. Stockholm is a wonderful city, I love it despite the freezing weather. Now we want to go there for summer, I bet it’s even more lively and beautiful. After reading your blog especially on this post, I am very excited and can’t wait to reach Stockholm in this coming January! Thank you so much for sharing, now my travel itinerary has been well expand! Enjoy Stockholm, it is a wonderful city! Thank you for your post! Ihave found many intresing things. Wonder, how is there on New Year? I want to find out it 🙂 Do you have some recommendation? We arrived this evening and are really excited about spending a week in your city – I’ll let you know how we get on! Stockholm is amazing! Hope you will have a great time! Hi Natalie -great blog -we went last Feb for a romantic few days in snowy February -lazy breakfasts,interesting places and great walks.We are doing the same in a few weeks time – so will enjoy some of the places you mention.From UK Easyjet do seriously cheap flights from Bristol -also if in a hotel make sure you get a good breakfast, that will keep you going for the day. We are fans of good breakfasts as well! I’m heading there in a couple of weeks for work…I really want to spend all my down time exploring the city…Never been there but looking forward to it.